The online Bachelor of Science in Leadership (BSL) degree program from Trident University gives you the knowledge and skills you need for leadership careers within a variety of organizations. Our online Bachelor of Science in Leadership (BSL) degree will prepare you to lead by instilling in you the information, skills, experience, and confidence you need to succeed. Create your own personal leadership development plan. Learn how to effectively deal with change within organizations. Develop your written and oral communication skills. Gain critical thinking and research skills. Advance your career – even while working full time. Join a dynamic online college network. In the Bachelor of Science in Leadership (BSL) online degree program, you will be prepared to effectively handle the challenges facing the leaders of today and the future. Our Learning Model emphasizes the development of real-world skills and experiences, so you’ll be ready to contribute to your organization’s success right out of college. See the Trident University Catalog for full descriptions of all program course offerings. Your courses at Trident will be relevant and inspiring. As a Bachelor of Science in Leadership (BSL) student, you will take a variety of classes, including Leadership and Change; Power, Influence, and Persuasion; and Decision Making for Leaders. The Bachelor of Science in Leadership (BSL) requires 120 credits for degree completion. You will take 36 semester credits of program core course work and 32 credits of concentration coursework. You’re also required to meet Trident’s general education requirements as specified in our course catalog. You will need to complete specific courses (or their equivalent) to satisfy general education competency areas. Have you ever thought about obtaining your masters degree? If so, we have a dual credit option that allows you to earn MSL degree credits while taking BSL program courses. We call it FastracDC and it is our fastest and most affordable pathway to a masters degree. By selecting the dual credit option you can have three of your upper division courses applied towards an MSL degree from Trident. Choose from the following concentrations. See the Trident University Catalog for full descriptions of all concentration course offerings. This concentration emphasizes integrating knowledge from different perspectives, developing strong analytical and communication skills, and taking creative approaches to problem solving and decision-making. This concentration develops leaders who are adept at team building, communications, and marketing. You will take courses, such as Principles of Marketing; International Business; and Strategic Management. Transfer students are required to provide official transcripts of all prior academic work without exception. Prior academic work will be articulated during the admission process. All courses, whether applied to a program or general elective in transfer will be posted to the student’s permanent record. Transfer credits will not be included in the calculation of overall GPA. At the undergraduate level, students may transfer in credit no matter the date of completion. In cases where the content of a course is deemed outdated or no longer relevant/equivalent by Trident, credits for that course will transfer as general elective credits only. Students may formally appeal transfer decision to the Provost or designee. Appeals must be submitted in writing within five business days and must be accompanied by supporting documents or evidence. Seeking more information on the cost of attending Trident University? 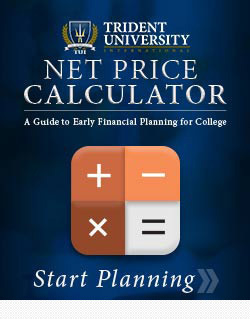 Visit Trident’s Financial Aid Resources page where you will find financial aid tools including Trident’s Net Price Calculator and Shopping Sheet, a guide to assist in early financial planning for college. Get Started Today – Apply Today! Meet Ricky Sengsavang, BS in Business Administration. Trident University's leadership faculty include seasoned professionals who worked for well-known organizations. We are proud to be recognized as one of the best resources for students looking to further their education in Leadership. We are very glad you chose Trident University for your educational journey! New students often have a lot of questions, and we’re here to help. As a way to ease you into our unique, student-centered model, we’ve designed a webinar that will cover all of the areas vital to success in your chosen program. This live webinar, hosted by Dr. George del Hierro and Professor Tasha Cureton, will bring you together with other new students on the first day of class. You’ll have the opportunity to talk directly to our academic leadership and get your questions answered. See you on your first day of class on April 29th!